Johnnie Walker, Bell’s Extra Special and J & B Rare, along with eight single malt scotches, are being pulled off of New Brunswick liquor store shelves as the distributor is looking to take the products elsewhere. The single malt bottles that are on their way out of New Brunswick include Glenkinchie, Dalwhinnie, Talisker, Cragganmore, Oban, Lagavulin, Brora and Clynelish. Lagavulin?! Talisker?! I’m going to have to buy those in Nova Scotia now, unless they’re affected, too. I’ll have to stock up. By the way, this is the topic the local CBC producer contacted me about – they wanted my opinion of this news. I was disappointed, too, that they only wanted a sound-bite. I hope this doesn’t follow through to Newfoundland. Laphraoig hasn’t been on the shelf for nearly a year now. I wish they would have warned me about that. I would have stocked up. I only keep one bottle at a time. Right now it’s Lagavulin. If both Lagavulin and Laphraoig aren’t available — well, here comes the Rapture. If they save your sound bite on a cassette, could you call it your “scotch tape”? CBC called my home today while I was at work, so I may get on the radio yet! Dana Clendenning, president and chief executive officer of NB Liquor, said most Canadian provinces will soon be out of these brands of scotch as Diageo, the world’s largest spirit supplier, is redirecting its products to more profitable markets in China, Russia and India. Scotch enthusiasts who favoured some of the discontinued brands may be upset, but NB Liquor said the new bottles should help satisfy the average drinker. I’ll have to talk to the guys at my local liquor store. I might have to stock up. This blows. Are the new brands from the Islay? NO! We have enough Highland scotches already, goddamn it. Plus, if one were to introduce someone to scotches I’d probably start with a Johnny Walker Black – hint of smoke with a bite of grain – not too harsh and not too expensive. I might switch to Maker’s Mark. No you won’t – doesn’t compare to Lagavulin. Oban. Hands down the smoothest. Here’s our friend, Don’s, collection. I arranged this table for him for a Robert Burns dinner 4 years ago and it’s still there. We also have a bottle of Caol Ila. It doesn’t have as much of the creosote taste as Lagavulin but its close. I have to have it with a wee drop of water and ice. Oban I can sip straight up. > Oban. Hands down the smoothest. I’m indifferent about Oban, but I had a bottle once long ago. I have to try it again. Cool. I usually have 3-4 bottles on the go. 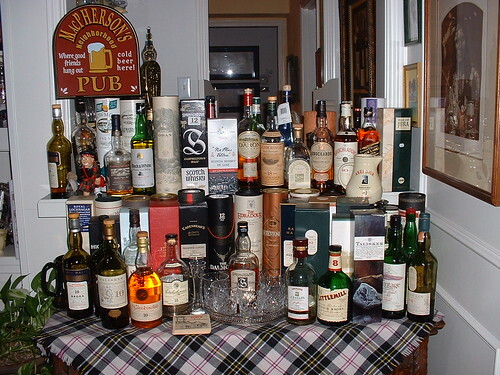 I used to keep ALL my empty single-malt bottles but I started to run out of room, so I threw them out. “Our friend Don” goes to Scotland about once a year (he teaches seismology to people in the oil industry) and he’s a bagpiper. He almost always brings home a bottle of scotch that you cannot buy in the states. He has some really obscure potions and there are no empty bottles on that table. I visited The Park Avenue Liquor shop in New York City about 10 years ago. Its single-malt selection was breath-taking. I just spent an hour there gazing at everything. I think I bought a $150 Ardbeg.